WineBottler 1.7.52 is a major update which sports some thrilling new features. Probably the most important feature is the update to run on OS X El Capitan. In Apples proven one-two-combination, after the visual fixes in OS X Yosemite, we could expect a major cleanup in OS X El Capitan. Apple did this with security on its mind, so the proverb “There is the Easy Way and Then There is the Right Way” smacked the lazy dev in the face, once again. First, Apple got rid of LD_LIBRARY_PATH and DYLD_FALLBACK_LIBRARY_PATH. Forcing us to “otool -L” and “install_name_tool -change” thru all the bins and libs of Wine to use proper @rpath relative paths for all Wine related libraries. The result is, of course, a correct linking through out the app – thank you Apple. I guess somebody has to kick you once a while to come up with proper solutions. Then Apple implemented App Transport Security which forces us to use secure connections for interactions between Apps and web services – or to disable it. For now it is disabled in WineBottler, but I’m working hard on offering SSL connections to get this right. After all it is all about security and privacy. Further there where some GUI/multithreading glitches (Toolbar and FilePicker dialog) that lead to crashes on El Capitan and the new Codesigning requirements that have been sorted out. A clean Wine prefix weights in about 35mb. But Wine requires big add ons like gecko (for Webservices, 50mb) and mono (for .net Apps, 200mb) by default. They might not be needed by your app, but blow up an empty prefix up to 300mb. These two add ons can now be excluded: down 84%. Further we added an option, to remove the “c:\users” directory when shipping an app. Wine will automatically add new users, when the app is run on a clients Mac. Then you can automatically remove installer files (.msi) from your prefix before shipping – if they are no longer needed. Lastly, we have optimized how WineBottler runs your prefixes. To this point, WineBottler will copy a prefix from the App to the folder ~/Application Support. This approach allows us to install Apps to restricted System folders, or Codesign them, without breaking the signature or having to give read and write access to the app, since the App works in the users Applications Support folder. We stick to that design, but we no longer copy, but link the files to ~/Application Support. Changes files will break the link and replace it with the new file. Unchanged files will only take up some bites, instead of a complete copy, saving nearly 50% of disk-space. THIS FEATURE IS STILL VERY NEW AND IN TESTING! So I’m more than happy to hear from you. Finally we included the current latest and greatest Wine: Wine changelog. For your ongoing interest and support for this project. All dough I can’t answer all the mails, I’m always interested in feedback and suggestions. Thank you very much. 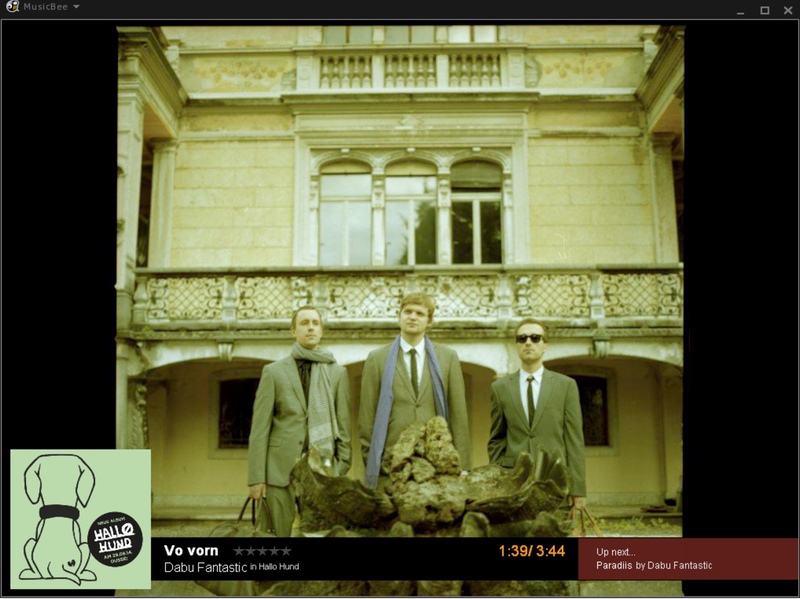 Listening to Dabu Fantastic playing on MusicBee 2.5 on WineBottler on OS X El Capitan. fix for the X11 fallback (missing dylib). fix for code signing on OS X 10.10 – that should allow you to install WineBottler without lowering your security-settings. And it is pushing Wine.app to 1.7.37. There will be an update to the stable branch of WineBottler and Wine.app, based on Wine 1.6.2 and all the new WineBottler features that appeard since WineBottler 1.6.1 came out. That said, I will land some major changes to the unstable branch starting next week 🙂 . 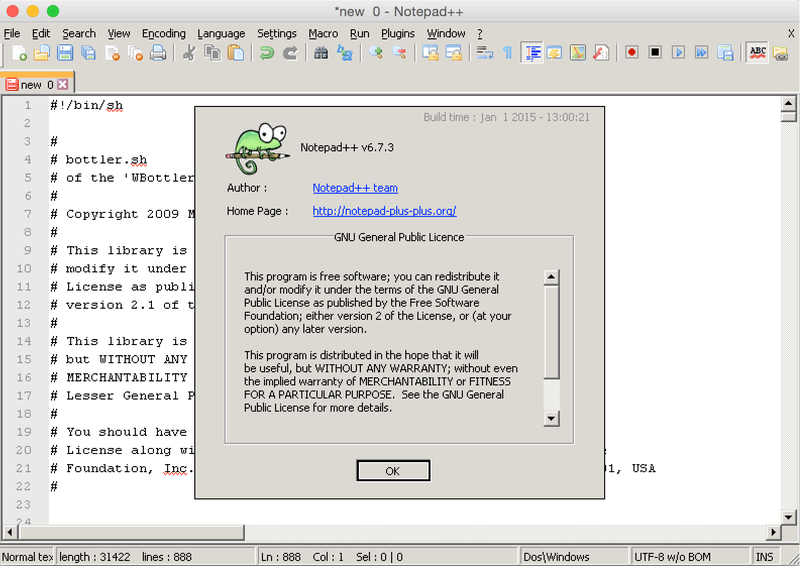 Running Notepad++ 6.7.3 on WineBottler on OS X Yosemite. you, our member projects, as well. - a snazzy Conservancy T-Shirt. giving time of the year! 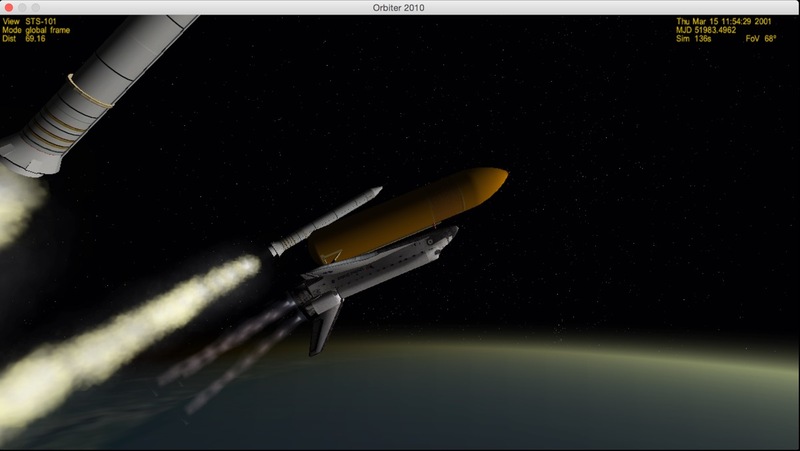 Running Orbiter running on WineBottler on OS X Yosemite. Just a small update for WineBottler. As noted earlier, the no-op file winemenubuilder.exe triggered some anti virus checks. Starting with 1.7.34 it should pass them all. Please download WineBottler directly from http://winebottler.kronenberg.org – there are some “download”-websites” that bundle WineBottler into an installer that will install adware on your system, too. Tweaking the new look and adding it to the progress window. Fixed a bug, that prevented WineBottler from finishing custom Apps on some Yosemite Macs. If you should still have issues with AV or generating custom Apps still freezes for you, please let me know. 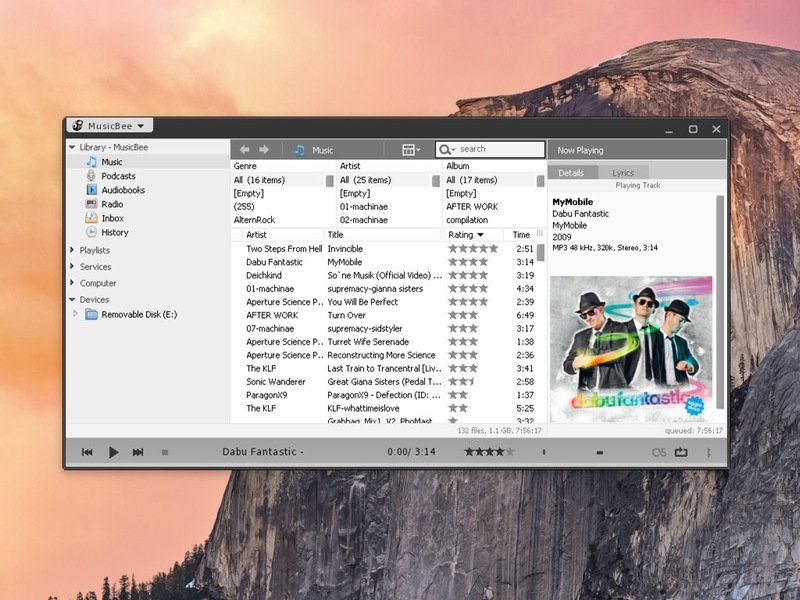 Running MusicBee playing Dabu Fantastic on WineBottler on OS X Yosemite. Just bumping Wine to 1.7.33.
winemenubuilder.exe still gives me false positives with some AV-scanner.